at a boat race in 2008. 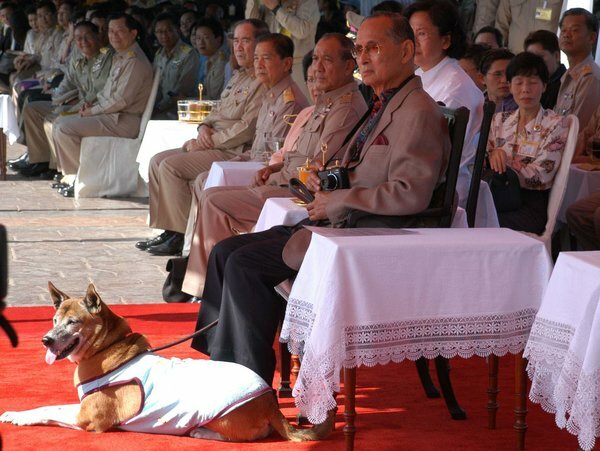 A factory worker in Thailand has been reportedly punished for being disrespectful towards their King Bhumibol Adulyadej's pet dog. He might have to be in the jail for thirty seven years for posting sarcastic comments about the innocent animal on the internet. The military court of Thailand has seriously dealt with the case by asking the worker Thanakorn Siripaiboon to explain why he had made such remarks. Failing to give any answer to the military court, the Thai worker will now have to spend long time behind the bars. Thailand's strict laws that make it a crime to insult the monarchy entered new territory after the verdict was given a few weeks ago to indict the uncourteous man. Thanakorn could face a total of 37 years in prison for his social media posts, highlighting what has become a feverish campaign to protect the monarchy and rebuff critics of the country's military rulers.